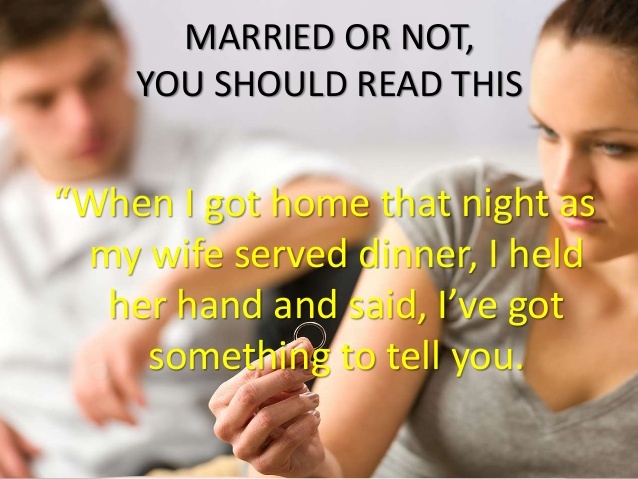 This story is about a marriage ending and will speak to everyone whether you are married or not. This man has fallen in love with a co-worker, named Jane. However, he is married to Amy and has been for 10 years. I know that sounds simple and common, but read on because I promise when you read their story, you will be stunned as the events unfold. When I got home that night as my wife served dinner, I held her hand and said, I’ve got something to tell you. She sat down and ate quietly. I observed the concern in her eyes. I avoided her question which only made her angry. That night, we didn’t talk to each other and she went to bed in tears. I knew she wanted to find out what had happened to our marriage, but I could hardly give her an answer. How could I tell my wife of 10 years that I had fallen in love with someone else? With a deep sense of guilt, I drafted a divorce agreement which stated that she could own our house, our car, and 30% ownership of my company. She glanced at it and then tore it into pieces. I felt sorry for her. I was sorry for how she was feeling, but I could not take back what I had said. I had fallen in love with Jane who worked at my company. Finally, she cried loudly in front of me, which was what I had expected to see. To see and hear her cry was actually a bit of a release. The idea of divorce which had obsessed me for several weeks now seemed to be firmer and clearer now. The next day, I came back home very late, having spent the day with Jane, and found Amy sitting at the table writing…something. I didn’t know what to say, so I went straight to bed and fell asleep. When I awoke, she was still there at the table writing. Without asking any questions, I went back to bed. Quite honestly, I just didn’t care. In the morning she presented her divorce conditions: she didn’t want anything materialistic from me. She requested that during the next 30 days, that we both work to live as normal a life as possible. Her reasons were simple: our son had his exams in a month’s time and she didn’t want to disrupt him with news of our broken marriage. This was agreeable to me. But she had something more. She asked me if I remembered our wedding day. And how I had carried her into out bridal room, over the threshold that night. She continued and requested that every day for the next month’s duration that I carry her out of our bedroom to the front door every morning. I thought she was going crazy. Just to make our last days together bearable, I accepted her odd request. Now, Amy and I hadn’t had any body contact since the night I told her of my affair and my plans to divorce her. So when I carried her out on the first day, we both appeared clumsy and awkward. Our son clapped behind us, cheering “Daddy is holding Mommy in his arms!” His words made me sad. From the bedroom to the sitting room, then to the door, I managed to get her to the front door. Before I put her down, she whispered, “don’t tell our son about the divorce.” I nodded in agreement, feeling somewhat upset. I put her down outside the door. We both headed off to work. The next day, as I carried her through the house, we both were a little more relaxed. She leaned on my chest. I could smell the fragrance of her perfume on her blouse. I realized that I hadn’t looked at this woman carefully for a long time. I realized she was not young any more. There were fine wrinkles on her face and her hair was beginning to gray. For a moment, I thought about what I had done to her. On the fourth day, when I lifted her up, I felt a sense of intimacy returning. This was the woman who had given ten years of her life to me and a beautiful son. On the fifth and sixth day, I realized that I still loved her. (I did not share my thoughts with either Jane or Amy) I also noticed, that It became easier to carry her as the month slipped by. Perhaps the everyday workout was making me stronger? One morning, as we were dressing for work, Amy mentioned that she was struggling with what to wear. She tried on quite a few dresses but because she had lost weight, nothing fit as it did before. Then it hit me. I suddenly realized that she had grown so thin, that was the reason why I could carry her more easily. A few moments later, our son came into our room and said, “Dad, it’s time to carry Mom to the door.” To him, seeing his father carrying his mother out had become an essential part of his life. My wife gestured to our son to come closer and she hugged him tightly. I turned my face away because I was afraid of the feelings I was having. I then picked her up and carried her through the rooms of our home. Her hands were wrapped gently around my neck, so softly and naturally. I held her body tightly and found myself feeling the way I had felt on our wedding day. On the last day of the monty, when I held her in my arms I could hardly move a step. Her weight loss now made me sad and concerned me. I held her tightly and said, “Im so sorry…I hadn’t noticed that our life lacked REAL intimacy. That evening I arrived home, flowers in my hands and a smile on my face. I felt so alive with my renewed love for my wife. As I ran upstairs to our bedroom, I found Amy. I found my wife lying in our bed – dead. My wife had been fighting CANCER for months but I was so busy with Jane, I didn’t even notice. She knew that she would die soon and that’s why her final request was so important to her. She wanted to ensure that our son would see me, his Dad, as a loving husband. Carrying his mom gently to the door everyday. This man’s story is so powerful and absolutely amazing! And if you’re in a marriage that feels doomed for failure, maybe you can find your own way back together again. I’m reminded of the Christian movie “Fireproof” as it offers a theme of reconciliation and making amends. If you haven’t seen it, check it out. It’s awesome!